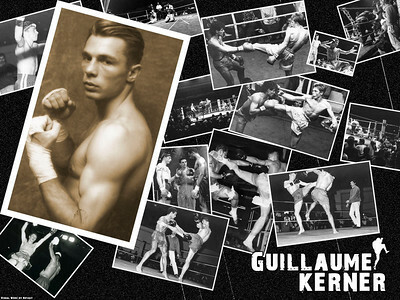 Guiallaume Kerner is known internationally as the blond angel of Muay Thai. Guillaume was one of the earliest pioneers of Muay Thai in France and achieved high water marks in the sport before becoming a full time trainer in Muay Thai. Among those accomplishments Guillaume was the French champion 1984-85-86-87-88, The European champion 1988-89, World champion in Bangkok, Thailand in 1994 and the world champion in Los Angeles, California in 1995. Much thanks goes to Guillaume Kerner and Fredric Jeans for making this interview possible. Q: What brought you to do Muay Thai? A: Muay Thai is my passion since I was 13 years until today Muay Thai brought me always try to be the best. Never give up in life, always searching the perfect thing to believe in myself. Muay Thai makes me travel. I am always discovering different cultures. I’ve met a lot of people from all over the world. I ‘ve learned Thai also English language with Muay Thai. As one of the earliest pioneers in Muay Thai for France what made you want to train and fight in Thailand? My teacher was the legend Pod Pad Noi Vorawooth. He talked to me about Thailand and also Thai fighters were superior than westerners. When I was only 14 years old I decided to go to train in Thailand in Sit Sorn Thong ( Khon Khien) in a real Thai Camp. The conditions were not as they are today. No air conditioning, no comfort and I didn’t speak Thai so the communication was difficult. The food and the culture shock was too big for me. But my passion for Muay Thai helped me to adapt myself.As a 14-year-old you are a kid. Far from home and also family and friends. The culture shock was terrible for a French kid. Everything was so different. I trained hard so I got a lot of victories in Thailand. Later, when I could speak Thai I really appreciated Thai life. Everything has become easy and today Thailand is my second country. Muay Thai was much less known internationally in the 80s. How do you think the training is different now compared to then? Only several foreigners came to train in Thailand in those days. Today, Muay Thai is more of a business. The fighters and fights were harder during the 90’s. Today, many westerners want to train Muay Thai. They want all the comforts: air conditioning and saunas. But the level of westerners are better today. In the 90’s only France and Holland produced champions that were able to fight the best Thais. What was your fighting record in Muay Thai before you retired? Let me tell you I have never been knocked out. I was never given an 8 count during a fight or knocked out. I’ve learned knees technique with the legend Diesel Noy at Ha Pharang camp. I’ve lost vs Rainbow in Macao because during the fourth round my nose was broken. It was hard to stand the pain until the end of the fight. I’ve been 5 times champion of France, 2 times European champion, 2 times world champion and I won against Coban in 1994 at Los Angeles. In 1995 during the King’s Birthday I won against Chainarong for the world tittle. How did you come by the nickname “Blonde Angel”? Because I wore white Thai shorts and I was young with blond hair. 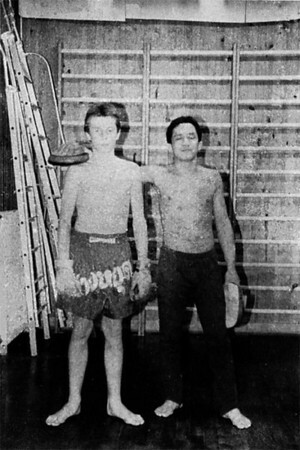 What was it like training under the legendary Pud Pad Noi? 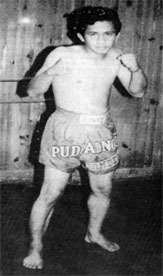 When Pod Pad Noi taught Muay Thai he insisted on perfect technique in everything. He had a great team to train with. 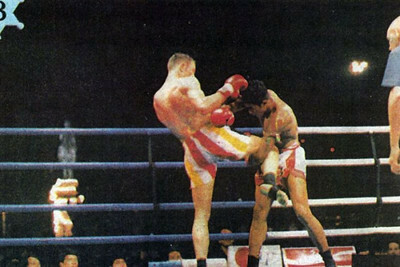 It seems to be widely acknowledged by most Muay Thai fans that the 1990s were the best era in Muay Thai. Do you agree that was the best time of Muay Thai? I agree. For example, in France we had Dany Bill, Jaid Sedak, Joe Prestia, Stephane Nikiema, Christian Garros, Mourad Sari, Dida Diafat, Moussa Sissoko, Aurelien Duarte, Christophe and Frederic Leveque, Mourad Djebli, Skarbowsky, Wilfried Montagne, Totof, Kamel Jamel and many other. Of course we have a great champions today such as Fabio Pinca, Mabel, Meddi Zatout and many others. If you compare times, we had more champions over the 90’s than now. During the 90’s the media and TV closely followed competitions. Today we don’t very often see Muay Thai on TV. What was it that made the 1990s era better than the present day? In Thailand they agree. If you ask all Muay Thai experts in Thailand, they will tell you that the 90’s had so many great fighters like Samart Payakaroon, Chamoipet, Diesel Noi, Toto, Hippy, Sakmonkol, Jongsanan , and Boonlai. One of your most notable fights was with Krongsak who in the past defeated Rob Kaman despite being outweighed by 10kg. What was the most memorable thing about that fight? Krongsak was the super champion! He was a terrifying fighter who never lost in Europe. He had great legs with so much power. My knees techniques were dominating him. Krongsak was growing really tired and he had no solution for my clinch. He threw a right elbow and I was cut open so the doctor decided to stop the fight. After this result I was so disappointed because I was dominating the fight. You also fought Wanpadhet who was a concurrent champion of both Lumpinee and Rajadamnern stadiums at the age of 19. How did you end up fighting such a high level Thai nak muay at such a young age? Let me talk about my first world title I was only 15 fights for 15 wins I was 20 years old. My opponent Wanpadeth had been Lumpini and Rajadamnern champion. I lost on points during 5 rounds Yet I touched him with high kick I was young and it was a great experience. You trained in many camps in Thailand. What were some of the camps you trained Muay Thai in Thailand? My first camp was Sit Sorn Thong located at Khon Khien North west of Thailand it was Pod Pad Noi camp. Later I started training at Ha Phalang, the camp of the legend Diesel Noi who destroyed all his opponents with his knees combinations. Diesel Noi taught me a lot of his knees combinations. I trained for my world title fight versus Chainarong for the King’s Birthday in 1995 and my camp was Sor Thanikul. I also trained at Sityodthong Pattaya and Sor Pleonchit in Bangkok. What did you learn having trained at so many different camps in Thailand? As you know, each camp has their own techniques so I ‘ve learned different styles. Now as a coach, I will advise any fighters to go to different camps to learn more. Each trainer has his own unique method to teach. What do you think the biggest differences are in Thai style training compared to western style training for Muay Thai? The way Thais count points are different: only knees, kicks, elbows gives more points. The western style is more of a boxing style; always searching to get the knock out with boxing combinations. Thais are good at clinch and they also are better at grabbing legs and knees and elbow combinations. Today westerners from all over the world have a better level than 7 years ago. Some Thais are not good at defense versus a boxer using only boxing so that gives a chance against Thais. But some westerners have a real Thai style and they can beat any Thai fighters. What was your proudest achievement you made in Muay Thai? My proudest moment was when I became the world champion during the King’s Birthday in 1995. Were there any low points for you in your Muay Thai career? Missing the media , the press , and the TV coverage. I understand you now have your own club for Muay Thai. What made you decide to teach? I should teach what I’ve learned. I am open to teach Muay Thai seminars all over the world. What students do you have from Team Kerner that the world should look forward to seeing? You should see students wanting to learn an authentic Muay Thai style. During a few years of training my student Mounir Bouti had been amateur world champion and he received the title of best fighter in Bangkok , Thailand. He knocked out 2 Thais in Radjadamnern stadium in 2006/2007. Mounir has been champion of France too at 60 kg where there are a lot of people at this weight. You now also offer international seminars. What things do you focus most on in teaching these seminars? What do you think is the most important lesson to learn for a new student of Muay Thai? To me the most important lesson is to be patient. New students need the repetition of techniques to get power. They need to work on all techniques. Do you have any final words for fans and students? Always give the best of yourself . Muay Thai must be a passion. You can stay up to date on Guilaume Kerner and Team Kerner at his official web site. ~ by fatsoking on December 15, 2010. Awesome reading on a true pioneer! I THINK I WAS AT YOUR LOS ANGELAS FIGHT IN 1995 ..I THINK THE PROMOTOR RENTED POLY TECH HIGH SCHOOL GYMNASIUM FOR THE EVENT. PROMOTORS NAME IS KIM I FORGET THE LAST NAME.. YES GOLDEN LEG WAS THERE WITH SOME VERY YOUNG FIGHTER. AT THE MOMENT I DONT REMEMBER WHO WON THE MATCH ..
BE GOOD . DO GOOD .CARRY ON !